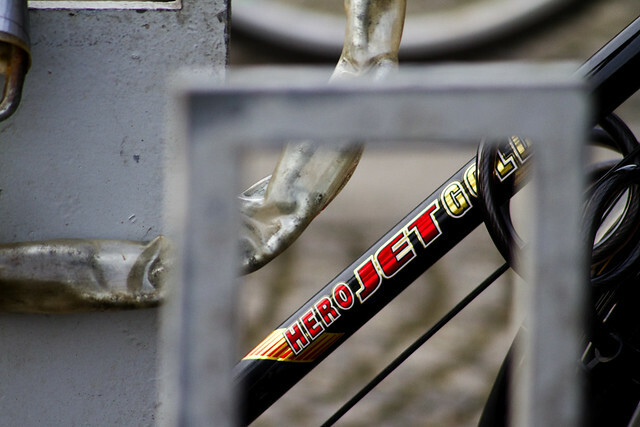 We spotted this bicycle parked in the racks outside the Royal Library here in Copenhagen. It caught our eye in a flash. Largely because we'd never really seen anything like it before. Black and shiny. Tall and proud. A little piece of India on Copenhagen's harbour. Flags on the front wheel?! Fantastic! Chainguard? Of course. Dynamo lights? Yeah, duh. Extra durable and shining?! Yes, please! 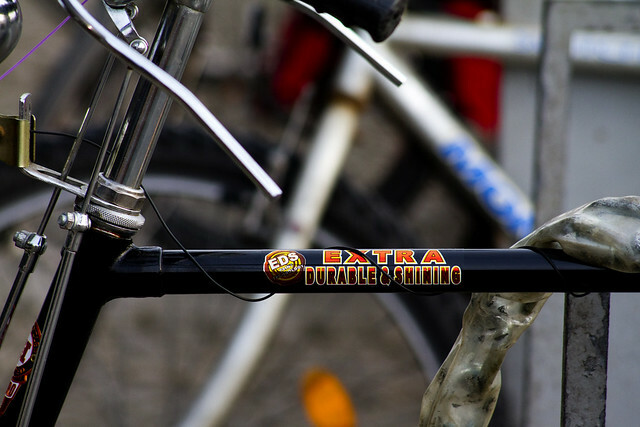 Fantastic kitsch graphics and texts all over the bicycle. In our enthusiasm to photograph the bits and pieces we... uh... forget to get a shot of the whole bicycle. We had to google the brand, too. 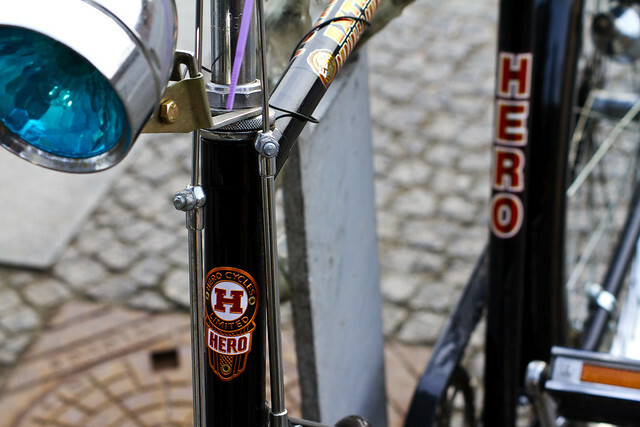 So here's a link to the bicycle on the Hero Cycles website. Niiiiice! The only thing I dislike is decals - I prefer frames without any, unless it's something as stylish as Rivendells or 90's Gazelle. But, on the other hand, these rod brakes and details... great! Have friend who brought the same bike back to the States from a trip home to India. I was amazed to learn that including the cost of the new bike and flying it home he had $85 in it. The bike itself was $35. Alas, pretty and nifty as they look, they're probably not very well suited for a North-west European climate. 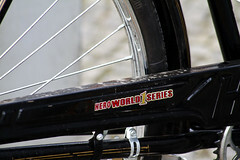 I've seen quite a few of the same genre of Indian bikes round Copenhagen, all of them terribly attacked by rust. Even worse than the new Raleighs. Very few bikes today seem to be able to take the beating of our Golf stream climate. My bid would be two: Batavus and Crescent. 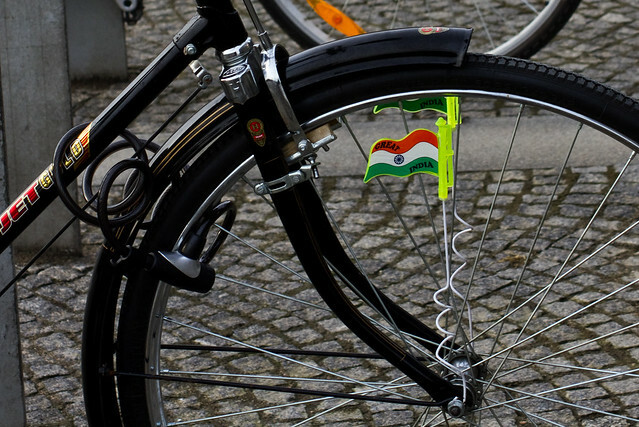 If one may include a road style bike, it would be Schröder. we have a big indian population in Toronto, I've seen that brand here being ridden by older folks going to work. Not in shiny condition like that model. It's a nice thing, but as Hagen points out the lack of rust means it can't have been in Copenhagen for more than 20 mins. 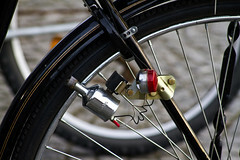 I have a Batavus made for the Danish market it has being sitting outside my front door in Dublin and used everyday. It has taken everything the Gulf Stream has thrown at it for the last two years and not a mark on it. Amazing I just love the thing. Oh one thing I had to fix a puncture once. I love the hook to attach an old-fashion lamp... Even a 1920's candle or acetylene lantern would fit perfectly! extra durable and shining.. I agree with Androgyne on those decals... but at least they're EDS!